Day 339 / Hat 339: Pink knit cap with heart-shaped Hello Kitty applique on front. (Kitty is sporting a crown, by the way.) Additional details include multicolored embroidered stars and hearts, dark pink contrast edge and the words "Hello Kitty" embroidered in white. There are two interior tags. The bottom one reads: "100% acrylic, exclusive of decoration, made in China," the top one reads "Hello Kitty by Sanrio, used under license, manufactured by Berkshire Fashions Inc." on the back and "Princess Hello Kitty, only at Macy's" on the front The princess part explains the crown and the overall air of feline royalty this cap exudes. Graciously loaned to the Project by Marilyn and plucked almost purely at random from the MRBOH. FYI, the green stuffed Grinch (another Seussian flourish) looming over the top of the cap is not part of it - nor is the red shredded floral thingy between said Grinch and the top of the hat. Their appearance is totally random. Sharp-eyed readers might be able to spot all kinds of other random things on the shelf behind me that seem like they should be INSIDE my head rather than outside. What can you spy with your little eye? Day 338: Hat 338: Heather gray, white and red knit cap made from a pair of sewn-together wool socks. Interior reversible lining is black polar fleece. 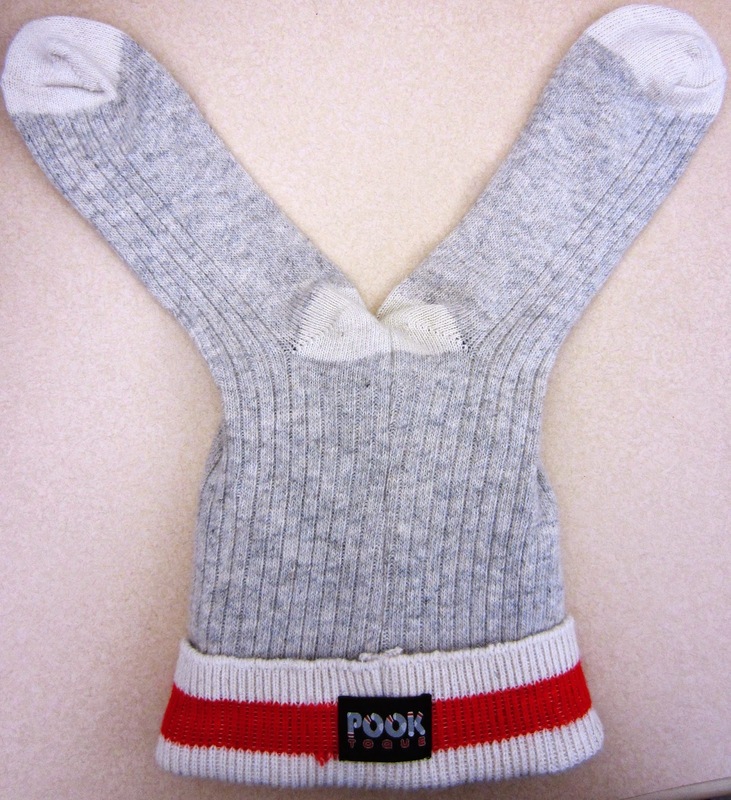 Matching labels inside and out read: "Pook Toque." This hat (in its unworn state below) arrived yesterday from my sainted mother who had told me she had a "curious" hat to send me for the Project. She was SO not kidding. Not only curious but Canadian as well. The included hangtag even includes a logo of a maple leaf surrounded by the words: ""Proudly made in Canada." I mean who doesn't want to stay warm in a cottage -- especially if said crib is in the Great White North? While the hat-tip undeniably goes to the Salted Fist of Nancy for this Canadian curio crafted of winter-grade woolen hosiery, the Bride gets honorable mention for her swift and spot-on judgment of the look, which she rendered less than 10 seconds after I plopped the Pook upon my pate. "You look like a human sock monkey," she said. Day 337 / Hat 337: Silver plastic Monster High tiara with pink faux gemstone embellishments and dangly logo bit in center front. Plucked for the Project on a Monday morn' from the MRBOH. 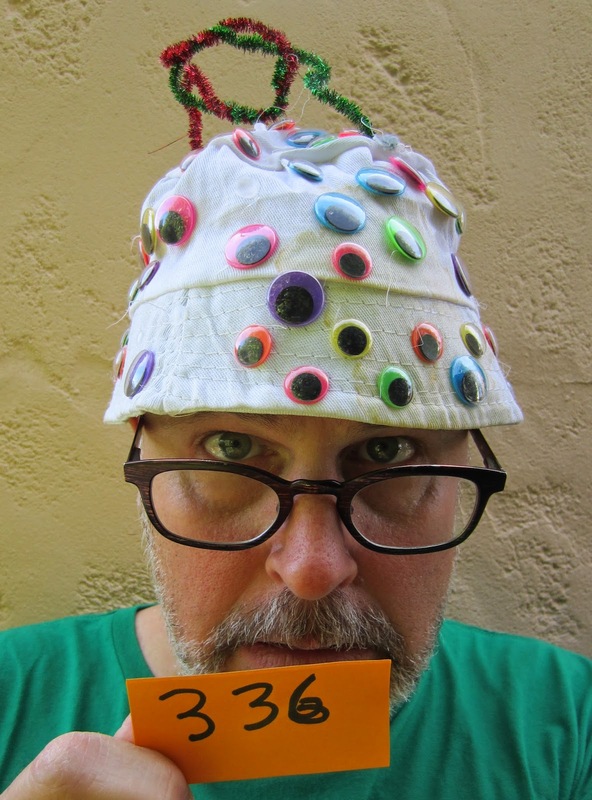 Oh, and if you were intrigued as I was about the back story on yesterday's "googly eye" hat, MR has graciously provided it (see first link below). Day 336 / Hat 336; White cotton bucket hat with multi-colored allover stick on "googly eye" embellishments. Additional detail includes intertwined red and green antenna-like embellishment glued to top of hat. interior tag reads: "Oriental Trading Co., Omaha,Nebraska 68127. made in China." Plucked for the project from the MRBOH, I can only imagine the googly eye details were an after-market modification to the original hat. 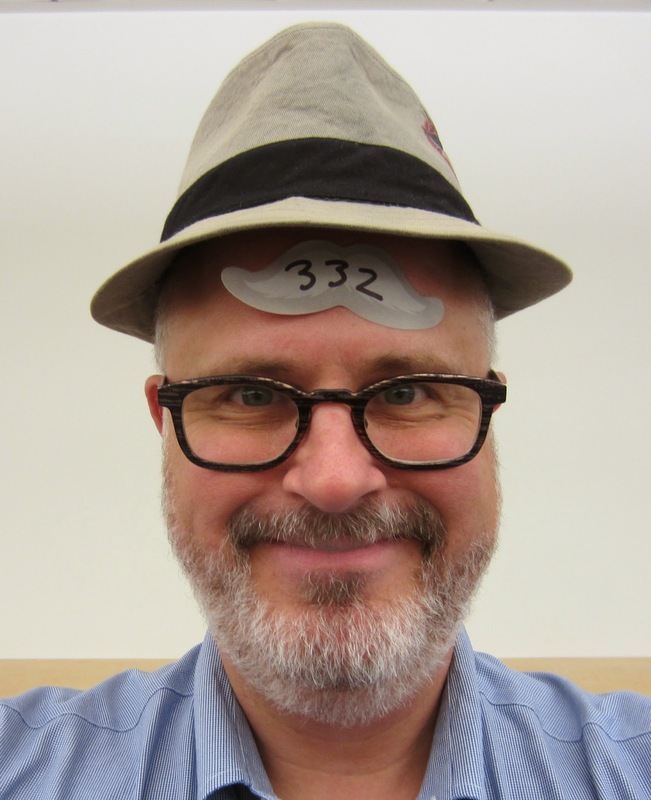 A quick eye census found 81 on hat with clear glue spots where another baker's dozen might have once resided. 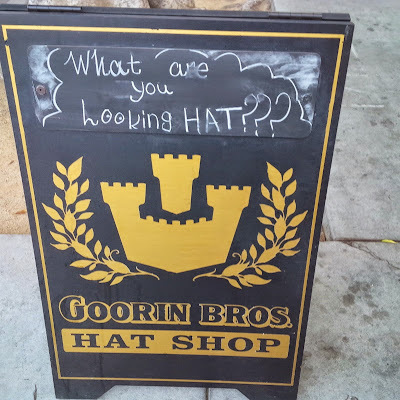 I have no idea what this hat's back story is, but it brought such a smile to my face, I couldn't help but post it as soon as I saw it. [Updated 4/28/2014, 9:47 a.m.] Post-publication, I e-mailed Marilyn who sent the following explanation: "The hat is about three years old, it was hand-crafted by Javier Sanches for his 1st grade ([he's] now [in] 4th grade) 100 day project. And, you're right -- there are some google eyes missing. The hat was given to each student and they were free to decorate with 100 of whatever they wanted." The hat-tip to Javier on that one! The eyes definitely have it. Day 335 / Hat 335: Blue, baseball-style cap with white Los Angeles Dodger "LA" logo on front. Additional details include adjustable size strap and white embroidery on wearer's left that reads "'47." By my reckoning this is the third Dodger-related lid in this batting line up and the second in a row. Day 334 / Hat 334: Hard blue plastic batter's helmet style headgear with white Los Angeles Dodgers logo printed on front and the barely imperceptible letters "MLBP, VWS" in raised blue plastic on flattened top portion of crown. Although I'm at a loss as to what the "VWS" stands for, the MLBP no doubt stands for Major League Baseball Properties. (Formed in 1966, it functions as the in 1966 as the various ball clubs' agent for marketing and trademark licensing and protection. 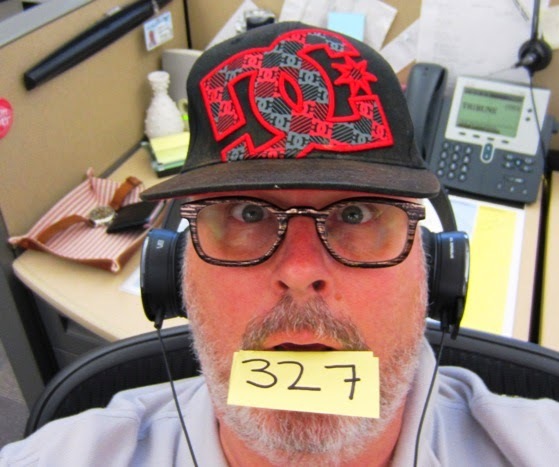 This headgear was graciously loaned to the Project by fellow cube farmer and generous Project donor Jenn Harris who was at a Dodger game a few days ago. 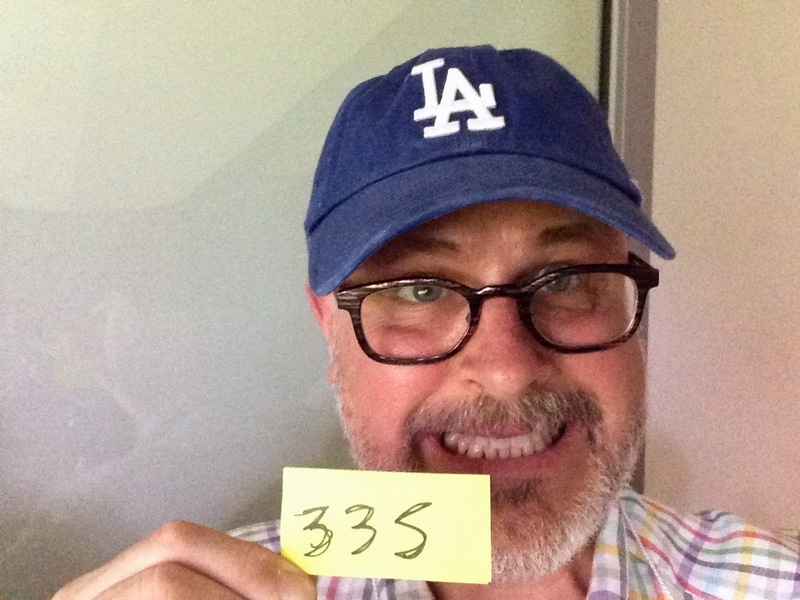 But I'm happy to report that, whatever the provenance, this Dodger keepsake came to me sans foodstuffs of any kind. 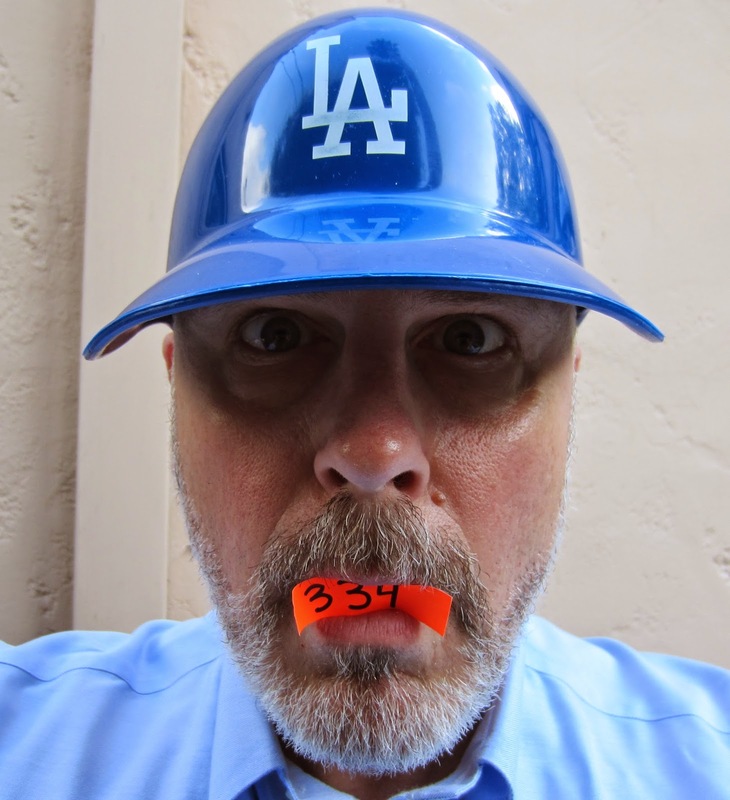 And stay tuned for more Dodger-related headgear as I'm taking in my first game of the season at Dodger Stadium this weekend. 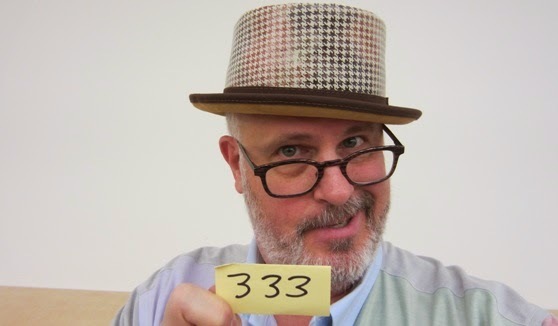 Day 333 / Hat 333: Leather porkpie hat with printed weathered hound's-tooth check pattern on crown and brown fabric hatband detail and contrast taping on 1 3/4-inch brim. Interior lined in black silk (or silk-like) fabric. Interior tag reads: "Ashbury Bourbon" on obverse and contains the quote "I'll sleep when I'm dead," on the reverse. The "Bourbon" part refers to the style name, and a quick check of Ashbury's site reveals this particular pattern/color combination as "Honey" (other options include "Burlap" and "Cedar"). So yes, I've gone all honey bourbon porkpie up top today. Which kind of makes me hungry. Another loaner lid from the PR sample closet at The Headwear Association, Ashbury (slogan: "Exclusive designs inspired by the S.F. underground. Unrivaled quality,") is a sub-brand of Head'n Home Handmade Hats. 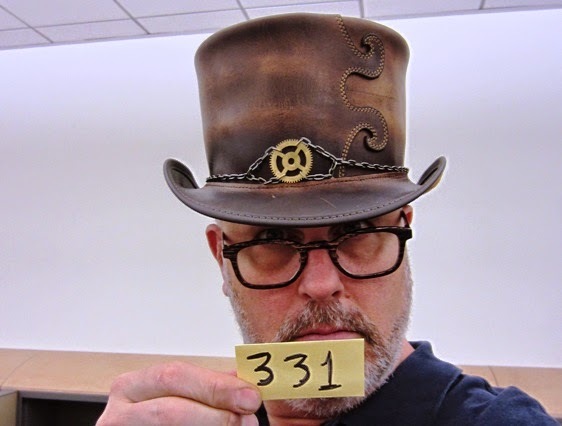 If that name sounds familiar to followers of the trek to 500, that's because They're the same folks that make the Steampunk Hatter line, a hat from which was featured in the extremely popular installment PC 331 two days ago. As for the quote tucked into the back of the interior label? I don't know about sleeping when I'm dead but I'm pretty sure that after the next 167 lids I'll be taking a quick hat nap. 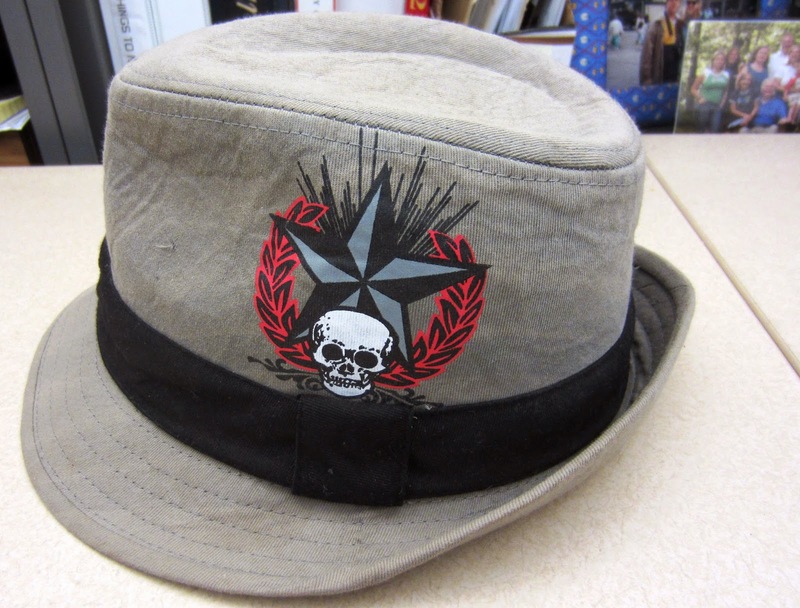 Day 332 / Hat 332: Khaki-colored stingy brim fedora with black hatband detail and screen printing on wearer's left side that consists of a military-like five-point star, skull and wreath design in white, black, red and gray. There are two interior tags. The top one reads: "Youth, 4-16, shell: 100% cotton, made in China" on obverse, and: "spot clean" on reverse. Second tag reads: "Target, 202070089, F16847579, Q3/09." Pulled for today's installment of the Project from the MRBOH, this swanky kid lid, in all likelihood, belongs to her son Javier. And based on my reading of made-for-Target tags, I'm going to hazard a guess this originally hit store shelves for the back-to-school season of 2009. The provenance of the design is a bit more problematic as there is no indication on the hat of a brand, collaboration or even private label designation. As it uses many of the same motifs as artist Shephard Fairey and his Obey Clothing brand, I'm going to guess that the design is meant to captitalize on the anti-establishment success of that brand. I say that because I don't recall - and my cursory search of the interwebs did not reveal - evidence of any kind of past deal between that brand and Target. If there was such a creature, this could well be a perfectly preserved specimen -- plucked from the amber of a tween boy's closet. So the hat-tip goes to Marilyn Ruiz, the assist to her son Javier. 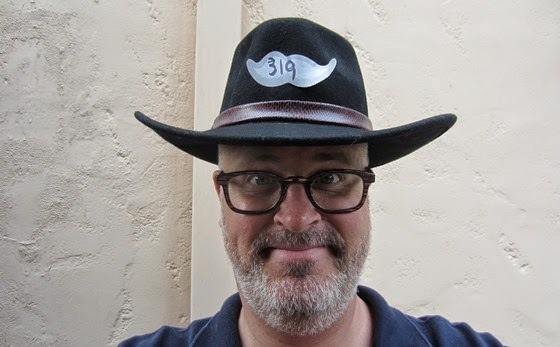 Day 331 / Hat 331: Hand-stained leather top hat with shapeable wire brim. Details include metal hatbaond chain with gear (visible on front) and tiny key (in the back) and removable interior cloth sweatband. One interior tags read: "Steampunk Hatter, Curio." A second tag reads: "California handmade" on obverse and: "7 1/8 - 7 1/4, 57 - 58 cm., change sweatband to adjust size for your perfect fit." "Fashion From Yesterday's Future: Victoria grace clashes with western villainy in the retro future world of the Steampunk Hatter. Whether you're an elegant, intriguing lady, a gentleman with a whimsical streak, or a denizen of the nefarious underground, our toppers will set you apart from the riff-raff. -- Head'n Home Handmade Hats"
"A gentleman with a whimsical streak"? As Garfield the cat might say: "I resemble that remark." Atr least the whimsical part. A hat-tip to the Steampunk Hatters -- and an assist to the continuously helpful PR folks working with THA. Day 330 / Hat 330: Baseball-style cap with black front and bill and black, pink and white aalover geometirc print. Applique on front of black and white skull wearing a pink hair bow (skull bow, maybe?) with faux gem and stud detailing. Additional detail includes neon pink printing on bill that reads: "Monster High." There are three interior tags. The top one reads: "Monster High, Monster Chic, Mattel Inc.," on obverse and "2014 Mattel Inc., ABG Accessories" (along with ABG's mailing address) on reverse. Middle/second tag reads: "100% cotton exclusive of decoration, Girls 4-16, made in China" on front with care instructions on back "Hand wash cold, lay flat to dry, do not iron.") Third/bottom tag is printed on front side only and includes the word "Target" followed by a bunch of what I can only assume are style/inventory numbers. 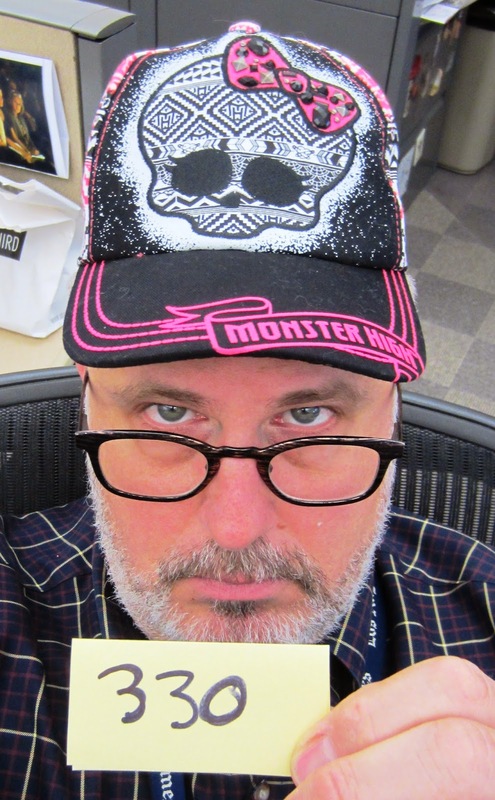 This is lid number three from the MRBOH, and I had no idea, until I grabbed this hat out of the bag what a "Monster High" was. A quick glance at the Wikipedia entry reveals it to be an "American fashion doll franchise created by Mattel and launched in 2010." The entry goes on to describe the characters as "inspired by monster movies, sci-fi horror, thriller fiction, and various creatures." I don't know much from fashion dolls but I know good word play -- and the list of character names gave me a good chuckle. They include Abbey Bominable (the daughter of the Yeti), Draculaura (you guessed it - Count D's kid) and Clawdeen Wolf (the daughter of a werewolf , her siblings include and older sister Clawdia) and, my absolute favorite, Deuce Gorgon (the 16-year-old son of Medusa). Deuce Gorgon? Monster High? Not a bad way to start a post-Easter Monday. May the rest of the week be as chock-a-block chuckle filled. The hat-tip to Marilyn Ruiz. **[Updated 4/23/14 1:13 p.m. PDT] A belated assist to Marilyn's niece Bridgette Rodriguez. "The cap belongs to her," MR says, "[she] forgets everything at my house." Day 329 / Hat 329; White faux fur bunny ear headband with pink satin insets. Sourced from the "Misc. Seasonal" box in the Garlodge to celebrate the holiday. And what a holiday it's been - the Bride and I just returned to the homestead after what felt like a celebrity Easter egg hunt - every time we turned over a rock or walked out of a church service it seemed there was another bold-faced name (or two or three) in close proximity. It started with "second church" (i.e. the contemporary service) at which we spotted "Law & Order" actor Sam Waterston. Post-churchin' we almost stumbled over Billy Bush (he of "Access Hollywood" fame) and family outside. Then, in the lobby of The Beverly Hills Hotel I exchanged a curt but courteous "hello" with Mark Wahlberg who was there with his family -- and, just in case you were wondering, neither of us were wearing our ears at the time. But things really kicked into high gear when Jay Z and Beyoncé and family (including Blue Ivy in the most ridiculously cute pair of bunny ears EVER) arrived at the Polo Lounge for Easter brunch. 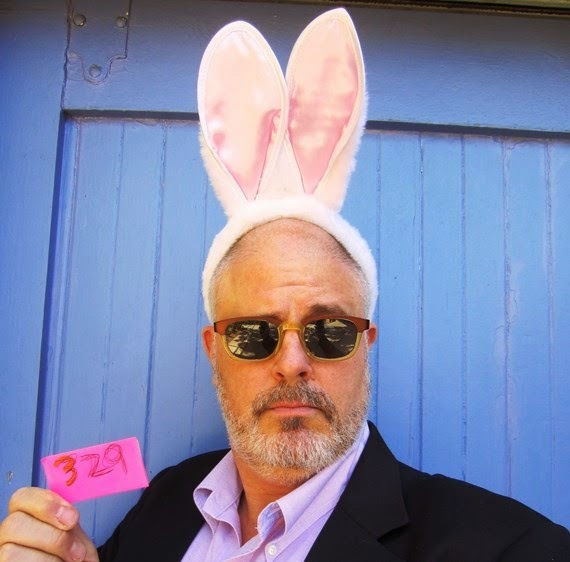 The Bride and I were a few tables away but, for a brief, shining, sun-fulled Easter afternoon, if you squinted just right, it felt for all the world like we were brunching it with one of the most famous couples in the pop culture universe. Our dessert celebrity sighting? That would be John O' Hurley -- the guy who played J. Peterman on "Seinfeld" -- who waked past us on the way to his table as we were wrapping things up. Spotted this sign on Larchmont Blvd. this evening. 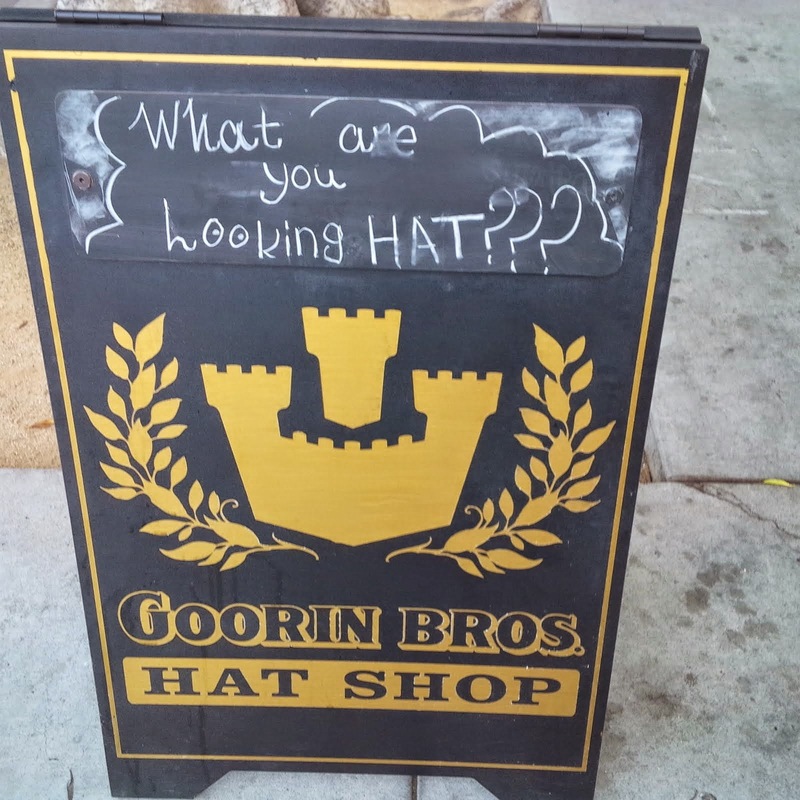 Who doesn't love a good hat-related pun? 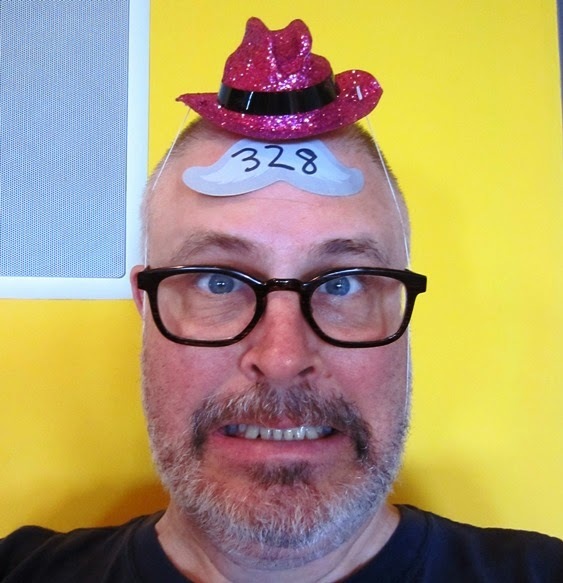 Day 328 / Hat 328: Sparkly, pink plastic cowboy hat with dark pink plastic hatband detail and elastic string. Interior tag reads: "Hat - Chapeau, Amscan, Inc. Elmsford, NY 10523, made in China." This is the second hat plucked from the freshly acquired MRBOH (the first was yesterday's) and if a traditional cowboy hat (like the Stetson I sported back at PC 50) is considered a ten gallon hat, then this one is probably a three-ounce version at best. I don't have a problem with that though because where I come from, three ounces is equivalent two shots (aka jiggers) of alcohol. Which means, in essence, I'm wearing a double-shot cowboy hat. As for the pink sparkly hue? Let's just say it matches my saddle and spurs perfectly. Day 327 / Hat 327: Black, baseball-style cap with DC logo applique detail on front that consists of interlocking letters D and C in allover print of DC/checkerboard pattern in black, red and gray. Entire logo is edged in red embroidery. Additional details include red embroidered DC logo on back, red fabric on underneath side of bill and stretchy Flexfit sweatband inside and no fewer than three interior tags. One simple reads "YOUTH" (yes, in all caps), a second reads "Flexfit, patent U.S. 5715540," and a third reads: "One size, style 76301061, 09-12, made in Bangladesh" on one side and "Spot clean only, 98% cotton, 2% Spandex" on the other." While I can't find a photo of this exact style online (the last numbers in the series make me think it dates back to September 2012), similar lids with similarly placed logos are referred to as the "Ya Heard 2" style. Graciously loaned to the Project by co-worker Marilyn Ruiz, she tells me it's one of her son Javier's favorite hats (Dude man is nine.) "You have to give that one back to me right away," she says, "He'll want it." The hat-tip to Marilyn, with the assist to Javier. And look for more contributions to come from the newly stocked MRBOH (Marilyn Ruiz Bag O' Hats)! 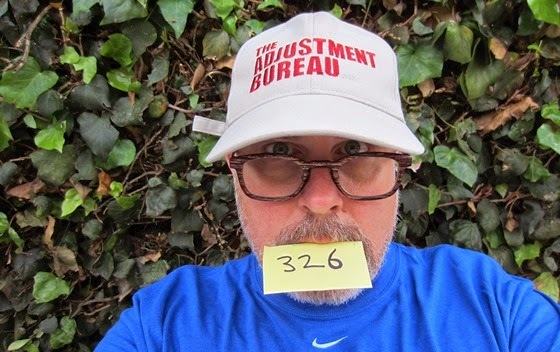 Day 326 / Hat 326: Khaki-colored basebeall-style cap with red embroidery on front that reads: "The Adjustment Bureau." Interior tag reads: "Authentic Head Shots by KC Caps," on one side and "made in Bangladesh" on the other. Most likely this was originally a cast and crew gift (or a promotional freebie) related to the movie of the same name. I purchased it minutes ago from the Good Will store at 7919 Beverly Blvd. not far from Project Central, having identified the store earlier this morning as a potential source of headwear. 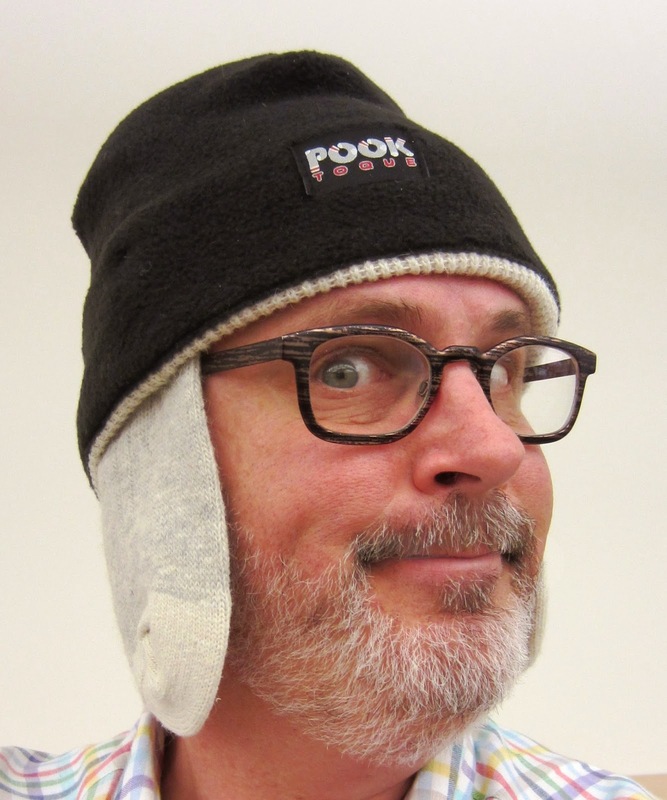 Oh, and just in case you were wondering, the hat is adjustable in the back. Day 325 / Hat 325: Gray printed paper pirate hat with black and white Jolly Roger print detail on front and and brown contrast printed edging. Additional detail includes elastic string to keep in place while buckling assorted swash. Photographed in front of the Pirate Lair (aka Garlodge). Notice the piratical-looking lock on the door behind me. 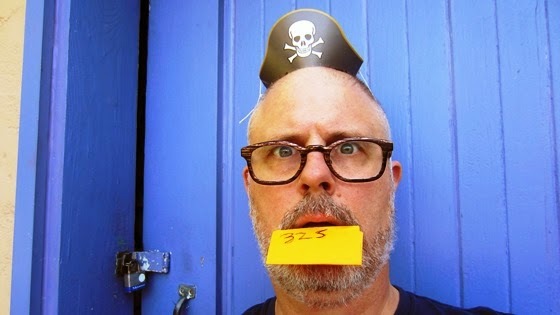 Yes, you're right, I should've saved it for Pirate Season but there''s more pirate gear behind yonder blue door. Trust me on that. And yesterday's hat was a big one -- in both size and impact -- so I figured today would be an appropriate time to play some small ball -- hat-wise anyway. Day 324 / Hat 324: Pyramid-shaped hat with base sides measuring 14 1/2 inches long and base to point sides measuring 13 1/2 inches. Constructed of cardboard and duct tape finished with a coat of gold spray paint. Detail on front includes stick-on "googly eye" embellishment that measures 7 inches in diameter. 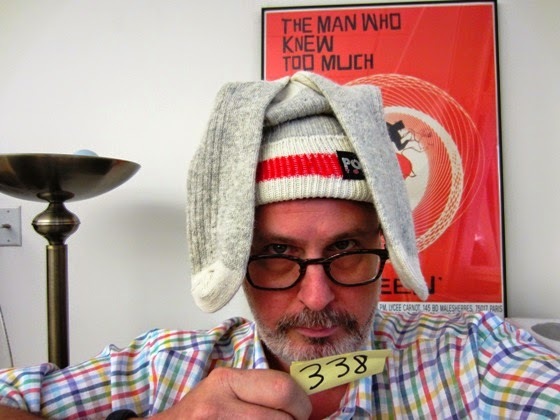 I'm writing you from all the way on the East Coast due to a recent discovery of your quest to wear a hat a day for 500 days. This is one of the most amazing blogs I've found. That being said I'd like to share with you a hat that I've recently produced with my friend Tiffany. The back story here is we want to win a costume contest for an "Egyptian" themed party. So what is more Egyptian than a pyramid, right? I've attached some blueprints [omitted here] that we drew up the other day. The only thing that this blueprint doesn't include is the 7-inch googly eye that we are putting on it tomorrow. Our question is would you at all be interested in wearing this hat if we shipped it to you? Ryan O'Connor (in the pyramid) and friends. 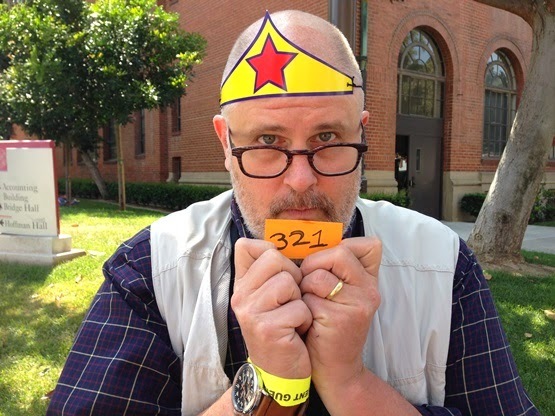 event, I should have won the people's choice award for best costume. That being said, Tiffany and I are done with the hat for now and it's currently making its journey to California via USPS! We're pretty confident you're going to enjoy this hat as much as us and all of our new fans from last night. This particular activity was an Egyptian themed party at a science museum here in Connecticut. We were searching for Egyptian headdresses and came across your blog chock full o' great hats. 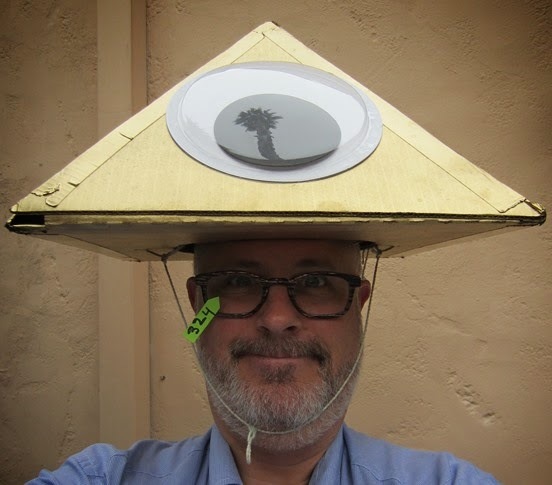 Keep us updated on the hat adventures and thanks for sporting this pyramid!" What Ryan doesn't explain -- but should be pretty clear to anyone with as much as a single dollar in their pocket -- is the reason for putting an eye on the top of the pyramid. 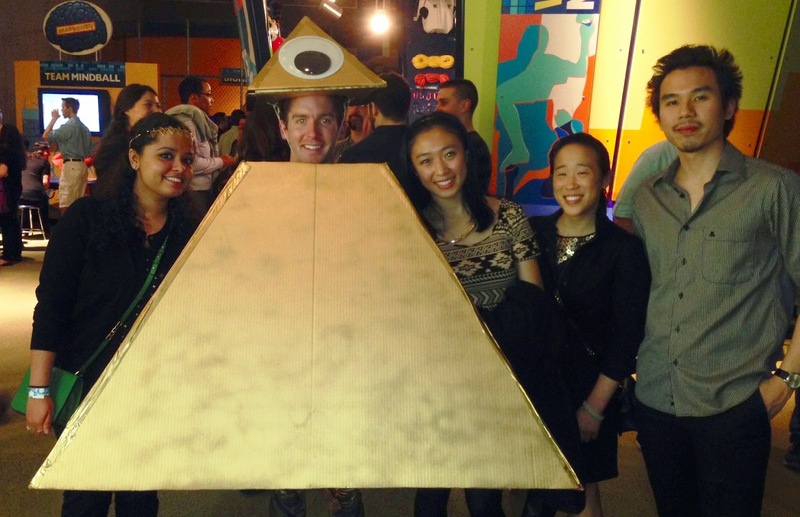 Ryan and Tiffany may not have won the costume contest, but as far as Project Cubbins is considered, their pyramid is right on the money! And for that, they get today's hat-tip - and a very sincere thank you. The world doesn't have near enough whimsy so keep it up! Day 323 / Hat 323: Hybrid trucker-meets-baseball style adjustable-size cap with ivory-colored mesh back and washed-down blue fabric front panel, bill and crown button. Additional detail includes white and blue embroidered applique patch of the Duke University Blue Devil mascot on front and blue "TW" logo on wearer's left (the same direction the devil is facing). Interior tags read: "Top of the World, towcaps.com," and: "100% cotton, made in Bangladesh." SKU sticker under bill reads: "dirty meshroyal size adj," which is actually covering another SKU sticker that reads: "vintage mesh." The Bride brought this hat back for the Project from her college reunion this past weekend (You may recall I borrowed another one of Duke lids for PC 238). And, unbeknownst to her, she may have brought back a bigger contribution than she knows. While examining the hat, I came cross a separate hangtag (see at right) that contained the Top of the World stylized shield"Take a photo of this cap, post at Facebook.com/towcaps, photos with most likes wins free hats." What the what? I can't think of a better way to help push Project Cubbins toward hat 500 (which, need I point out, is only 177 hats away) than to "like" my way into a pile o' hats. If you agree with me, let your thumbs do the talking -- I say we see if we can get Top of the World to help put Project Cubbins over the top! In the meantime, today's hat-tip, with a double-down of future assists, goes to the Bride. 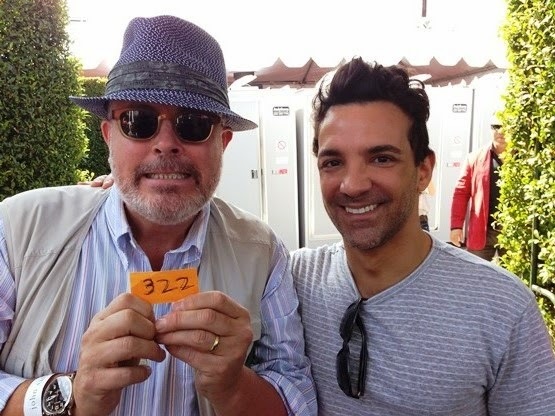 Day 322 / Hat 322: Blue and white woven fedora with pleated floral fabric (a jacquard, I believe) hatband detail photographed at the 11th Annual John Varvatos Stuart House Benefit this afternoon in West Hollywood. Graciously loaned to the Project by stylist, "Fashion Police" co-host and author of the recently published book "Glamour by George," George Kotsiopoulos (with me -- sans headgear -- in the above photo). "It's from Zara," George told me of its provenance. A cursory search of the Zara website turned up this Floral Hat with Band, which describes the composition of the hat as "100% paper," and the embellishment (we're guessing that's the hatband part) as "100% cotton." GK was a good sport for loaning his lid so a sincere thank you along with a stylish tip o' the hat for his contribution. Day 321 / Hat 321: Gold paper Wonder Woman tiara with red star in center and blue (possibly black - I didn't pay too much attention) edging detail. "All variations of Wonder Woman throughout the Multiverse wear a small, golden (or occasionally silver) tiara adorned with a red star, a symbol of her status as princess of Paradise Island. The tiara can be used as a throwing weapon, similar to that of a boomerang. With her level of super-human strength Wonder Woman is capable of cutting very durable substances, a prime example being when she cut Superman's throat to temporarily disable him." 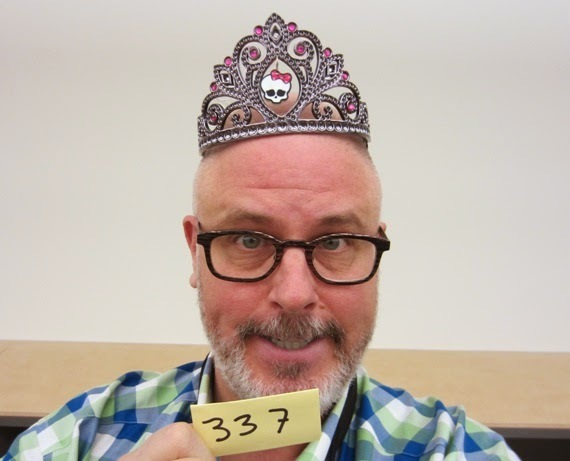 So that hat tip goes to Alaine for the gracious loan of the paper tiara (which she literally pulled from her purse to have me place temporarily atop my head). Day 320 / Hat 320: Trucker-style cap with green mesh back, white foam front and green bill. Black screen printing on front reads: "Gone Squatchin," with the logo of the Animal Planet logo below and to the right (but, curiously, without the final apostrophe). Interior tag reads: "65% percent cotton, 35% nylon, one size fits all, made in China, RN 129231." 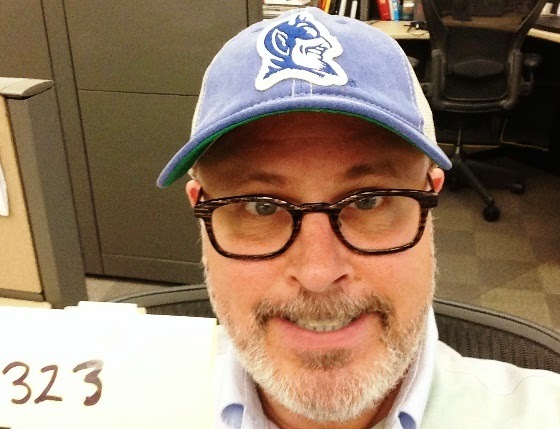 Borrowed for the Project from the between-desk-divider in close proximity to Calender section compatriot Chris Lee who told me: "It's nominally my hat, it's actually more Amy Kauffman's - she wears it more than I do." 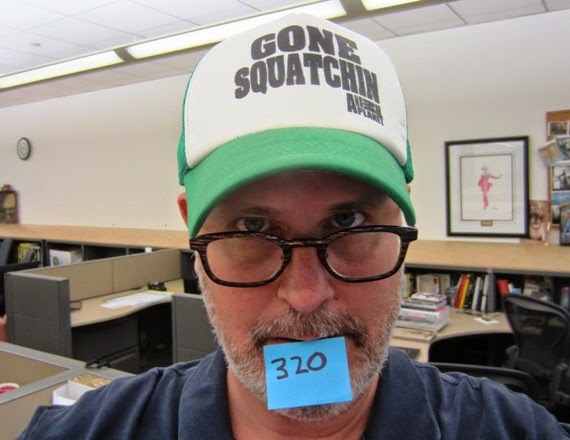 Lee explained that the hat was part of a promo for the Animal Planet show "Finding Bigfoot." A little interweb sleuthing turns up this civilian version (sans logo) available through the Animal Planet online store. And that's not all, other offerings include T-shirts ("Keep Calm and Squatch On") and a set of four drinking glasses -- because you'll never truly find Bigfoot unless you start your hunt at the bottom of a pint glass. And maybe, just maybe, when the finally find Sasquatch they'll discover he has custody of that missing apostrophe. Until then we're gonna loan one of our own -- and go Squatchin'. Day 319 / Hat 319: Black cowboy-style hat with pink faux-snakeskin hatband detail and black grosgrain sweatband. Interior tag reads: "Liz Claiborne, made in China, see over for content." Reverse side reads: "100% wool, exclusive of decoration." Cribbed from the Bride's headgear archive. Of its provenance she says: "I think I bought that back before hats were so big [as in popular]." She says she probably bought for some kind of "cowboy situation." "I think I got it when we were getting to go to Santa Fe for Thanksgiving or something like that," she said. At any rate, the Liz Claiborne of old doesn't exist any more - the company changed its name to Fifth & Pacific and sold off the namesake brand to J.C. Penney Co.a few years back.